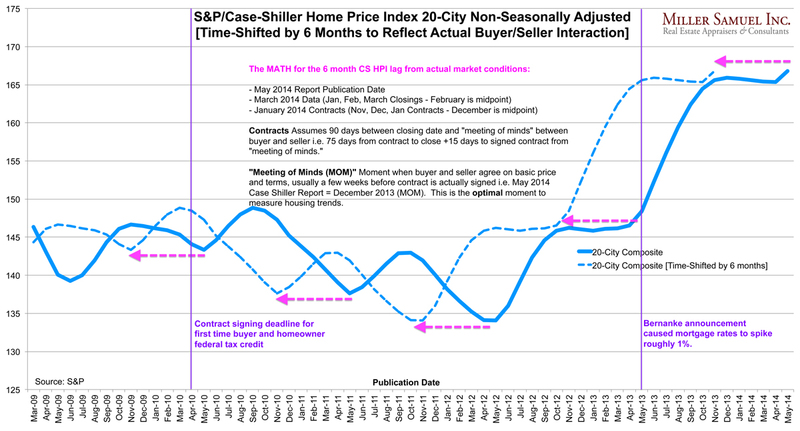 With any significant unexpected and historic event, the initial impact to housing can be seen in the form of a “pause” until buyers have enough time to process it. I first wrote about my “milestone” theory more than a decade ago. There was a New York Times cover story a month after Lehman collapsed in 2008 that used our data to mark such a milestone. A “pause” can be measured in days or months and market reaction can ultimately go against conventional wisdom. Back in August of 2011, after S&P downgraded U.S. debt ratings, it was thought to be catastrophic to the U.S. economy yet the world’s investors flooded into U.S. treasuries for safety, pushing interest rates to the floor, ultimately giving a boost to housing. I may not know much, but I do believe this: potential changes in government social policies should be kept separate from potential changes in economic policies, otherwise it is impossible to take action on anything in your life. This probably includes making decisions about whether to buy or sell a home. This U.S. election campaign has been brutal and at this point we don’t know how much of what was said about social policy will be enacted. This uncertainty may keep some buyers on the sidelines longer than others, but otherwise I’m not sure any of that matters to the housing market. On the margin, I am hearing that a few buyers have placed their purchases on hold. This is a normal reaction after a significant historic event but eventually many of those participants wade back into the pool when they are more comfortable. Stock futures were down significantly overnight but the financial markets moved higher after initially falling. With a quickly rebounding stock market, I’m don’t think home buyers will take very long to decide whether to rejoin the housing market. 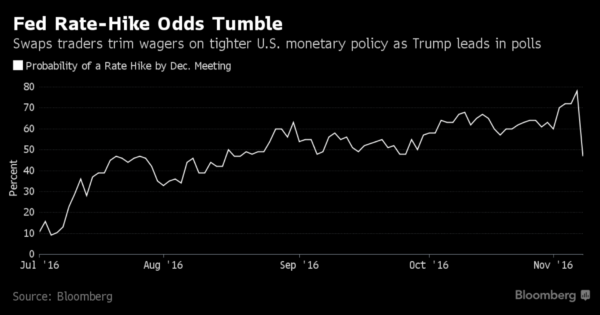 In addition, the odds of a December interest rate increase by the Federal Reserve dropped sharply despite yesterday’s view of a rate hike as nearly a sure thing. The president elect’s economic platform, which was not widely discussed during the campaign, proposes a large tax cut and investment in infrastructure which are either favorable or neutral to the housing market. Before the election, the housing market was generally softest at the top over the 18 U.S. markets we cover. 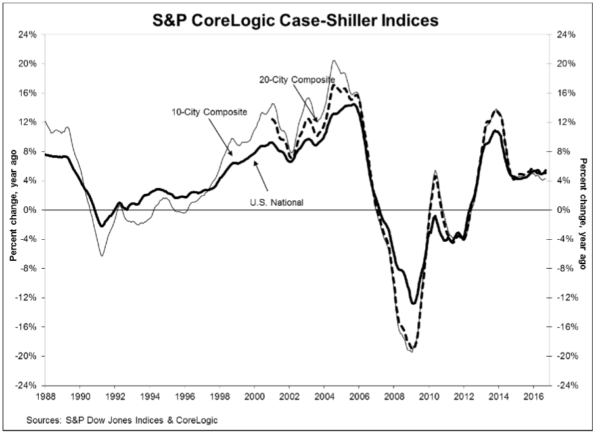 I believe inventory will continue to be more readily available at the higher end than for other segments. 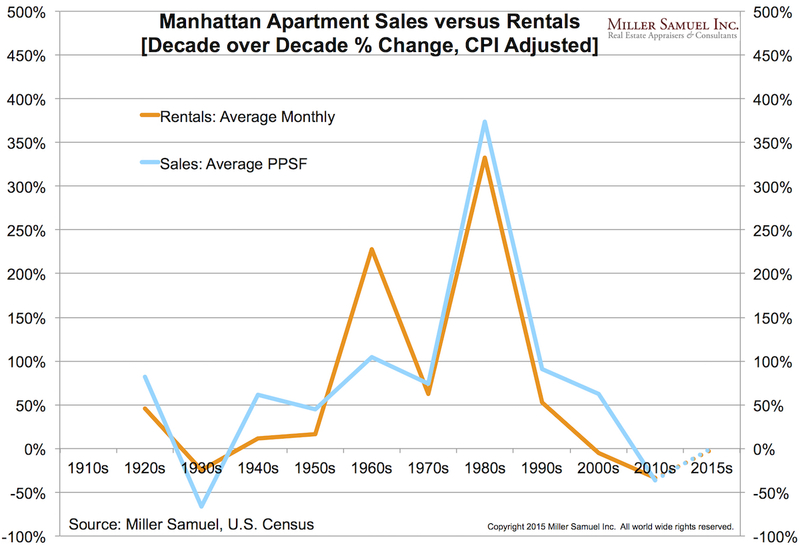 In New York, the slow down in sales was assumed to caused by the pull back of foreign buyers. However this decline was equally matched by domestic buyers over the same period, so the foreign buyer decline has been a false narrative. 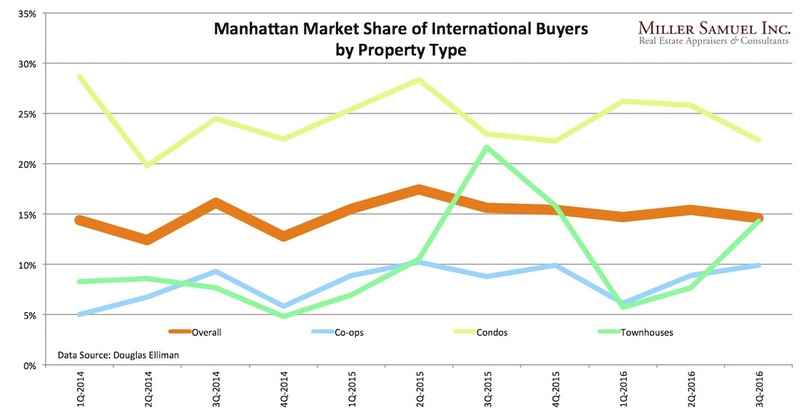 The sales share of international buyers has remained stable for for nearly 3 years. I am speaking at the The Real Deal conference in Shanghai next week and will look to understand sentiment towards further U.S. real estate investment. 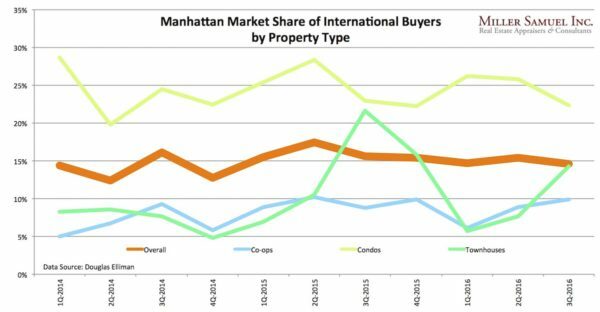 Rather than the international buyer narrative, I attribute the New York sales slow down to the visceral view of new residential towers rising from empty lots. Construction lending nearly dried up at the beginning of the year so the pipeline will slow quite a bit over the next two years. With world economies generally falling or remaining weaker than the U.S. economy and the continuation of near record low interest rates, I don’t see much impact from the U.S. election results after the short term jitters pass. Of course, I was wrong about the election. Hard to believe we’ve been around so long. 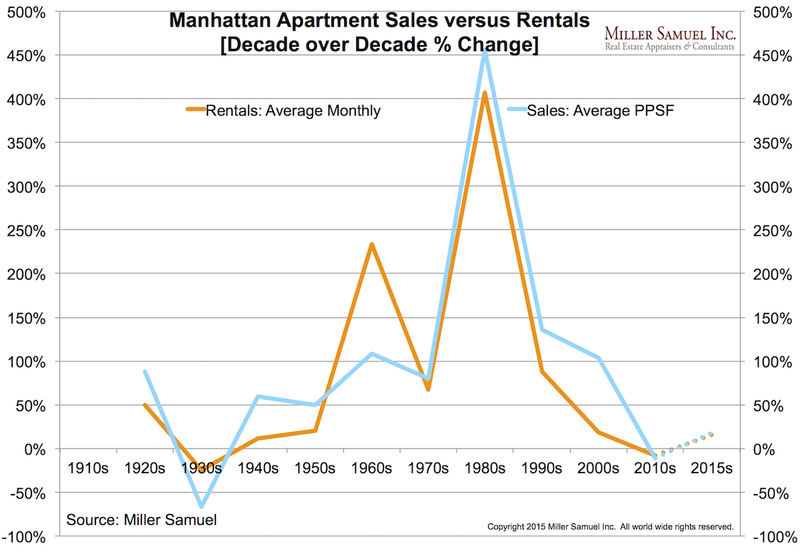 I personally feel about 29 years old (maturity of a 19 year old, obviously) yet after we published our Manhattan report today that cited 26 year record highs, the math places me a bit older than 29. My birthday was yesterday (I’m still milking that day for all I can) and our company’s birthday is today. We launched in 1986, working in our apartments and communicating via fax machines, buying Macintosh Plus computers, creating our own appraisal software, using bar code scanners, Scantron readers, tape measures, measuring wheels, sonic measuring devices, laser measuring devices and beepers. It’s been a surprisingly fun but difficult journey. Real estate reporter Katherine Clark at the New York Daily News got the scoop on the $70,000,000 penthouse sale at 960 Fifth Avenue, the highest price ever paid for a Manhattan co-op apartment. Curbed New York lays out all the (pretty?) pictures. The previous record was held by David Geffen, who paid $54,000,000 in 2012 for the Penthouse at 785 Fifth Avenue. Although the Geffen penthouse was renovated, it was 12,000 square feet, more than twice as large as the 5,500 square feet within the penthouse at 960 Fifth Avenue – that just sold for a record price of $70M. 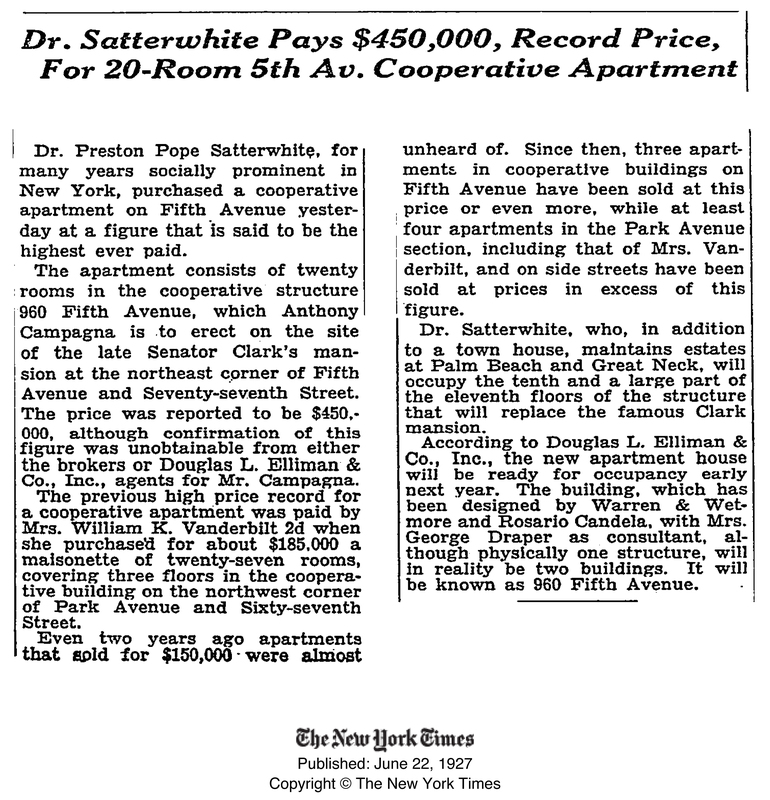 David Geffen paid $4,500 psf for the penthouse at 785 Fifth Avenue for the then record price of $54,000,000. 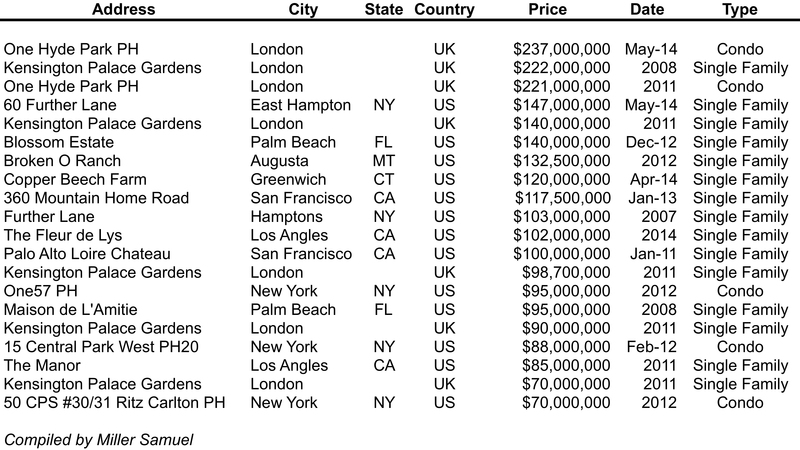 Nassef Sawiris paid $12,727 psf for the penthouse at 960 Fifth Avenue for the new record price of $70,000,000. On a sales price basis, the new record is 29.6% higher than the old record of 2 years ago. 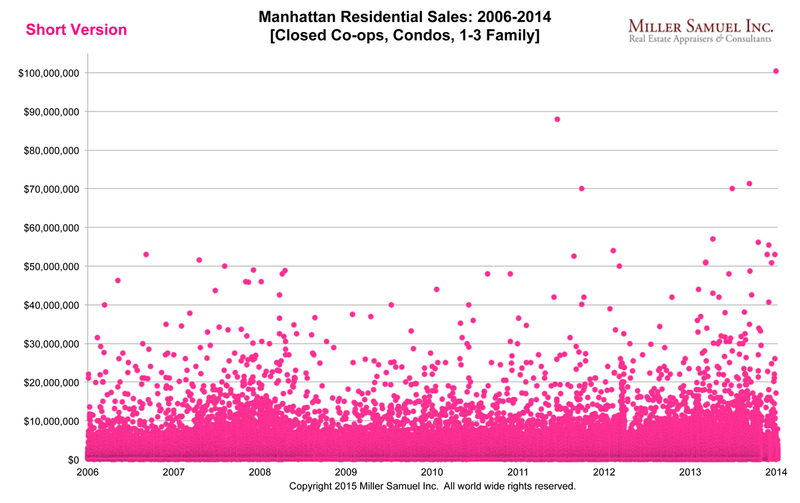 On a price per square foot basis, the record sale was 182.8% above the previous record sale price set two years ago. 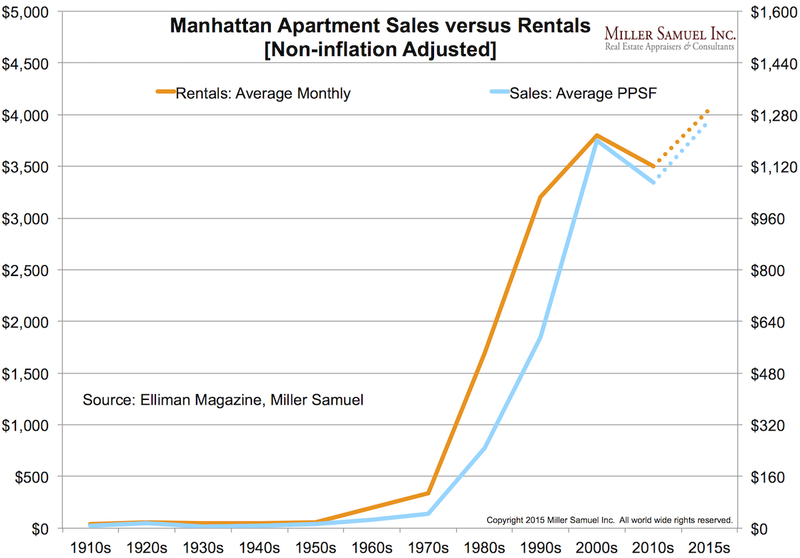 With all the attention focused on the newish or new development residential condo market, the all-time price per square foot apartment record was set 2 years ago, around the time of the Geffen purchase. 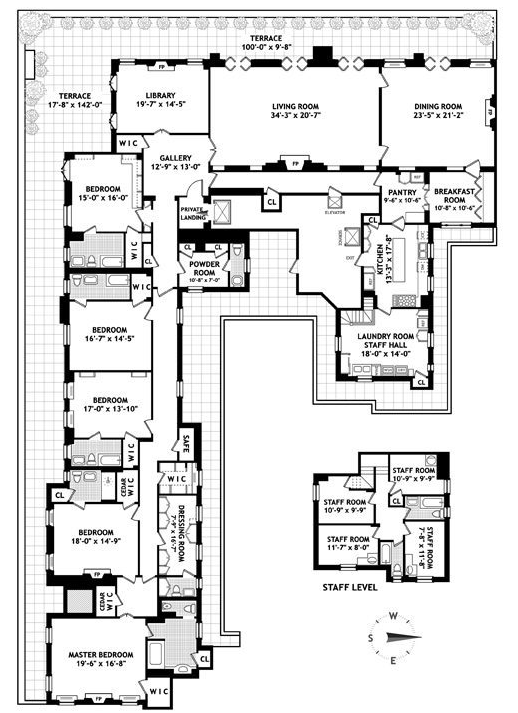 A Russian oligarch paid $88,000,000 for Sandy Weill’s penthouse condo that works out to $13,049 per square foot. That record breaking sale was largely viewed as a market outlier, that the buyer overpaid as part of a larger divorce strategy – since it was 31% higher than the previous record in the year prior within the same building. The 960 Fifth Avenue co-op board is old world and I’ve heard it is fairly tough. As a general statement, it is not that common to see a foreign buyer at the high end of the market approved by a co-op board. The news coverage suggested the buyer was slow to pay his taxes and negotiated a reduced amount with the government. This would be a concern for most co-op boards in terms of collecting maintenance charges in arrears from a foreign national if they stopped paying. Since these conditions would probably make any high end co-op board nervous, perhaps this is a sign that shareholders (board members are also shareholders) are concerned about damaging potential property values by limiting the universe of people that would be able to afford these types of prices in this new market condition. 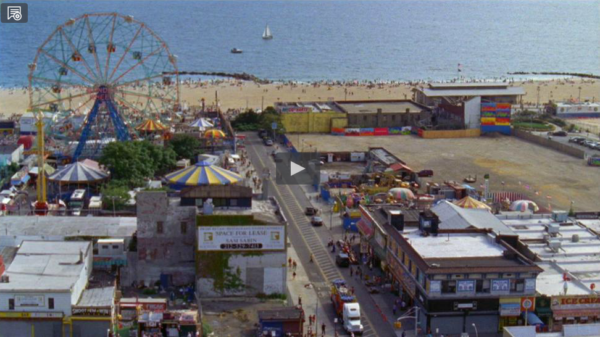 I saw the documentary: ZIPPER: CONEY ISLAND’S LAST WILD RIDE (here’s the trailer) over the weekend on the land use battle in Coney Island. I like the filmmakers’ focus on the guys that ran the “Zipper” (the ride is guaranteed to make me throw up) to humanize the development battle between NYC, Coney Island residents and the developer. Plus you can’t go wrong with a good Blue Oyster Cult song in the opening. After watching the documentary (you can purchase or rent it here), you can’t help but see how difficult it is to develop property in NYC striking a balance between community needs with economic feasibility as well as navigate political power and government. 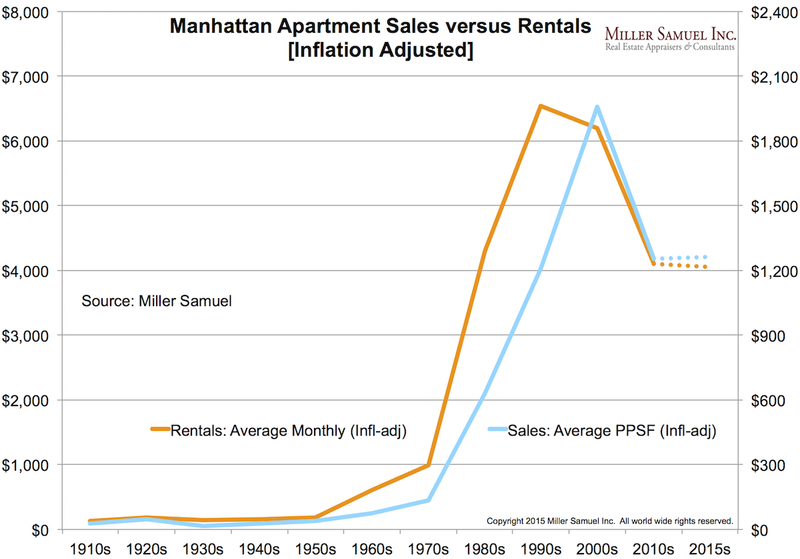 This difficulty is a key reason why residential housing costs are so high in most urban markets. Still, a new ride in Coney Island was just opened – The Thunderbolt Roller Coaster.